Much of the material culture of past was fabricated from timber, and, just as significantly, fuelled by wood, a material that is usually invisible to archaeology. Thus, provision for fuel storage, like sanitation and water supply, is one of the basics that have to be considered in the analysis of built environments. 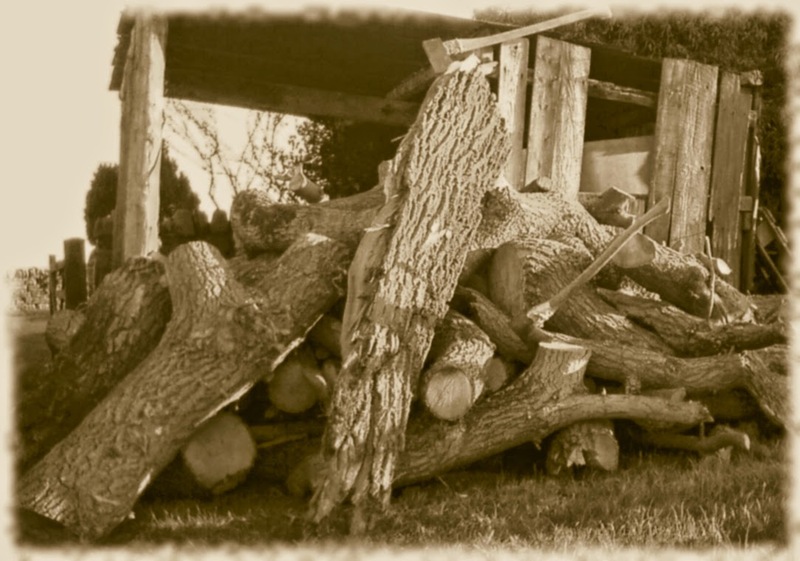 Traditionally, firewood is measured by stacked volume; a “cord” being a stack of 8x4x4 feet, or 128 cubic feet, including the spaces between logs. The calorific value of a cord will depend mostly on the actual mass of solid wood and its density, so it is difficult to be precise or make comparisons, but we could nominally say a cord was equivalent to 3,341 kwh . A medium sized house in the UK uses on average 13,500kWh of gas for heat and cooking [& 3,200kWh of electricity] , so to replace this with wood require about 4 cords [16’ x 8’ x 4’]; so a year’s supply would fill the garage, or perhaps the spare bedroom. Freshly cut wood from living or recently deceased trees has high moisture content and will not burn readily or efficiently, thus it has to be stored, preferably undercover while it dries or seasons prior to its use. The size of a woodshed should reflect the amount of wood required, allowing for a buffer stock of drying timber, as well as that required for immediate use. Thus, in an ideal world, a woodshed should be able to accommodate 2 years supply of wood. Since it would be unwise to assume all readers are familiar with the use of firewood it is worth discussing how firewood is made. Modern fire wood is dependent on the chainsaw which can cut through very thick stems with ease, splitting the resultant logs is comparatively easy. However, cutting across the grain of large logs manually is hard work, particularly with axe, where there is a lot of wastage. If I had only an axe, as was probably the case for much of prehistory, I would be looking to fairly small diameter wood that is easy to cut into lengths. 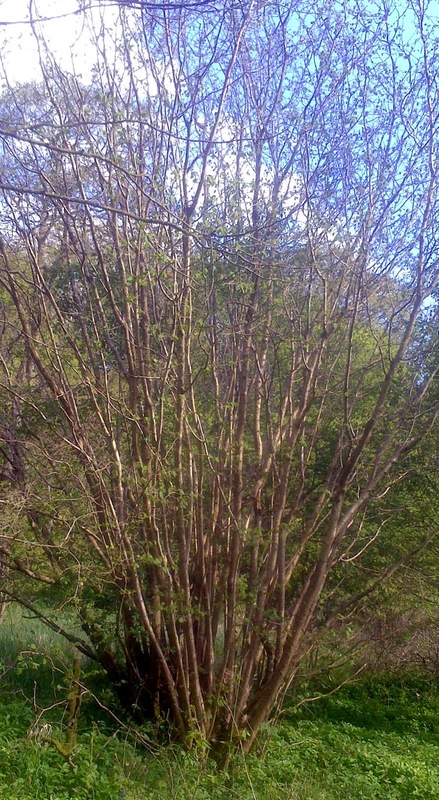 Thus, coppiced stems of something like hazel [left], or oak, a typical English woodland mix, would be ideal. 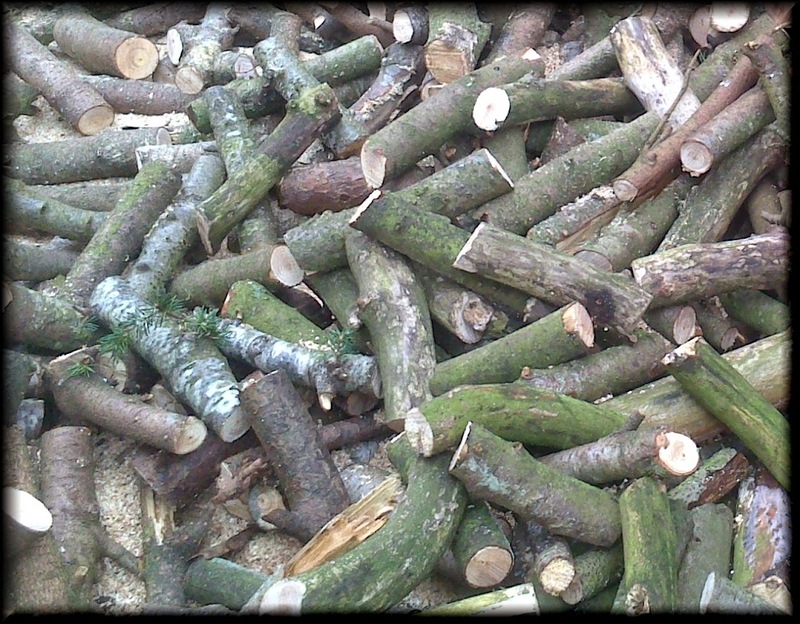 While there is no reason why woodland may not be managed to produce firewood, the long-term aim is usually to produce timber for other purposes, but these systems produce ‘thinnings’ - weaker trees or limbs weeded out to make space for the better specimens. 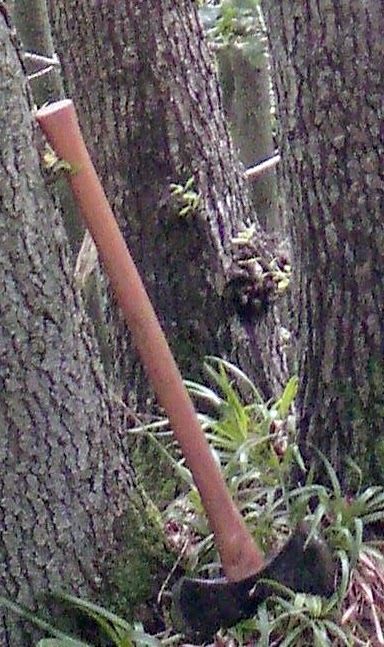 Thus, firewood is often a byproduct derived from thinnings and other unwanted wood such as side branches, as well as from damaged or fallen trees. o Even quite small diameter wood is useful as kindling for lighting or rejuvenating fires. Land and the trees growing it traditionally belong to individuals or groups, so it is wrong to imagine firewood is a product that is freely available, but since fuel like food it is one the essentials of life some provision has to be made for the common people. This charming depiction of medieval fuel poverty, [written in 1859], is telling us is that the poor man has not laid in stores for the winter, and is hunting around for scraps to burn. He has no wood and likely no woodshed either. Pine logs, [above], burn fast and hot, ideal for heating the hovel of King Wenceslas’s fuel impoverished neighbour, but as they tend to ping burning fragments into the room - it is not as generous a gift as it may seem. The king might have chosen apple, pear, or even cherry for its pleasing scent, although holly, which burns particularly hotly, would be an ideal gift as a Yule log. For a king, in England, [if not Bohemia], most of his stock should be beach, oak, hornbeam and ash, with some apple, hawthorn, yew and holly for special occasions. Other common woods burn like birch burn too quickly, or poorly like chestnut, so would be avoided by those in a position to choose. You need fires for heat and cooking all year round, so a range of firewood is ideal; if you can afford to picky, just as there is probably a best wood for smoking salmon, there is an optimum wood for spit roasting or other culinary operations. Subsistence firewood, which is scavenged from the environment, is usually dead wood, branches and small trees have usually succumbed to some form of rot, so that a lot of the calorific value represented by the cellulose has already gone, [left rotten fallen beach ]. 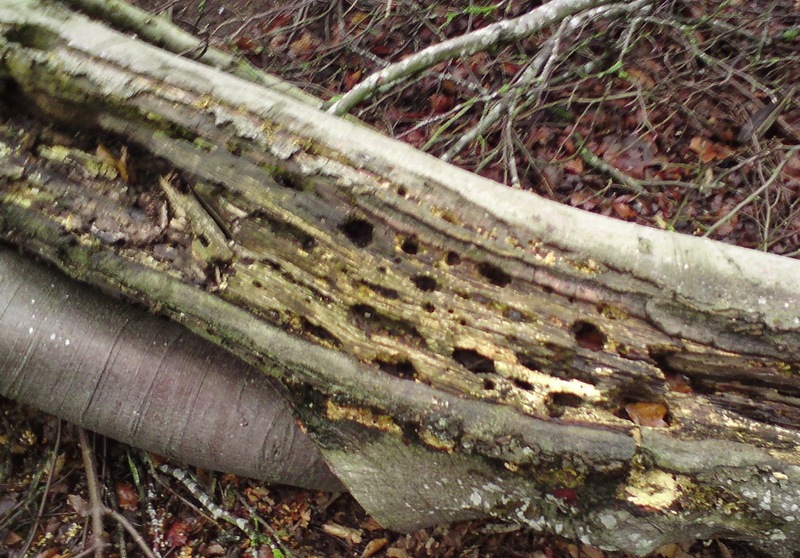 Dead wood picked from the ground may be damp, difficult to burn. and will produce a lot of smoke. However, the dead branches removing removed trees “by hook or by crook”  is often fairly dry, and is typical of the sort of rite enjoyed by local people over common and other land. The rite to cut specific amounts of wood, known as affuage / estovers , , and the duty to provide it for others, were part of the feudal and later legal systems that governed the functioning of the countryside. Despite its apparent abundance, in some areas firewood be a limited resource which can be over exploited, and once the tree cover has been removed, as on some islands, fuel shortages may make life difficult, especially for the poor. 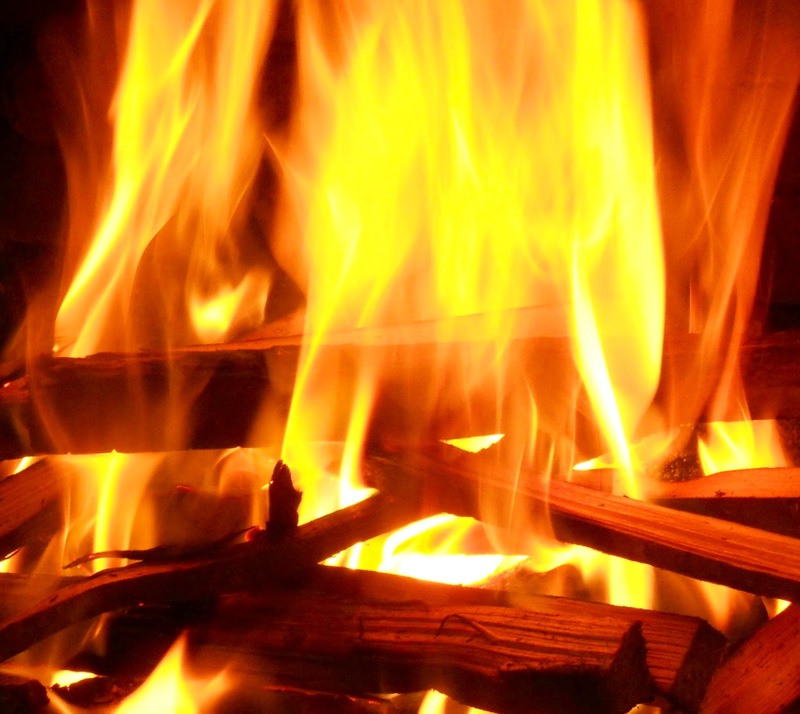 Fire is essential to life, so other sources of fuel such as peat have to be used in some areas, however, if coal is readily available, it might be used in preference to wood. Fire was used to heat buildings and cook food, it is a part of the pattern of life; clay has successfully formed the basis of hearths and ovens, so the combination of wooden floored buildings and fire is not something that should concern us unduly. Given each household could burn tons of wood a year, surprising little charcoal is found; we do find ash pits, close to large buildings such as Woodhenge ; how far you live from your own rubbish might be regarded as a social indicator. To understand firewood use would be a fundamental insight into households, and would tell you a great deal about the socio-economics of a period. While wooden artifacts formed the basis of ancient material culture, they are seldom preserved except in exceptional circumstances, however, it also must be borne in mind, that once objects have outlived their usefulness, they can still serve as fuel. 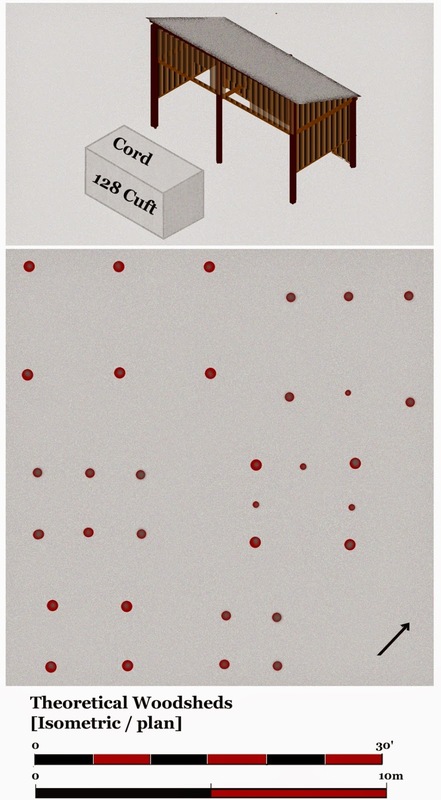 Small four / six post posthole structures are known, but are routinely conceived of as granaries, although a woodshed would probably have been part of any domestic built environment of a reasonable status, it is not something that archaeologists have routinely recognised or sought in the palimpsest of postholes found on prehistoric sites.